The GFBNEC Archives team will be attending the Oral History Association (OHA) Annual Meeting on Friday, October 14th, 2016 in Long Beach, California. We will be giving a presentation about the work we have been conducting using the Oral History Metadata Synchronizer (OHMS). OHMS is a web-based application created by the Louie B. Nunn Center for Oral Histories at the University of Kentucky Libraries, and is used to import and index oral history interviews. We are using OHMS to catalog and index our oral history interviews from our Hanashi Oral History Project. Example of a Hanashi oral history interview that has been indexed in OHMS. Our presentation is going to be a part of a larger panel discussion called “Discovery in the Digisphere: Oral history at the intersection of technology, archival technique, and the law.” We will be discussing our own experience with using OHMS, and how it has become an integral part of our workflow within our National Digital Archives of Japanese American Military Service (NDAJAMS) project. My first memory of Oral History Metadata Synchronizer (OHMS) was feverishly searching the Internet for information about it upon learning that I had received an invitation to interview with Go For Broke National Education Center. I started my work on the Hanashi Oral History Project here at Go For Broke with little knowledge or experience with oral histories in general. Therefore, OHMS was a completely new resource for me to learn and familiarize myself with. Learning the ins and outs of OHMS was a process that I approached in stages. Initially, I had to orient myself with performing the basic tasks associated with OHMS, such as indexing and tagging interview segments. Next, I needed to learn what exactly OHMS could do in terms of working with other software and platforms to help preserve and host the oral history interviews that Go For Broke has collected (and is still collecting) from Nisei veterans. Once I felt that I had progressed to an acceptably competent level in those areas, I transitioned to also considering the role of OHMS in the bigger picture of what our Archives staff here at Go For Broke imagines for our Hanashi Oral History Project. After working in OHMS personally, hearing about what my colleagues have said about working in OHMS, and seeing what the archives community has had to say about OHMS, I have realized that OHMS is a simple, effective tool that helps our staff process oral history interviews in an incredibly secure environment . The best metaphor I could use to describe OHMS is that it is acting in the role of a middleman during our processing. It is a helpful tool that aids us in reaching our end goal of transforming these valuable interviews into user-friendly, educational resources that we can preserve long-term. The flexibility within OHMS allows us to utilize it in that fashion. Yet, there is more to be done on our end outside of just using the Oral History Metadata Synchronizer in order for us to accomplish that end goal. OHMS has proven to be an almost indispensable resource in helping our staff proceed with processing and preserving our collection of oral histories. I know I feel indebted to the University of Kentucky and its Louie B. Nunn Center for Oral History for developing this platform. Without it, I fear we would still be at square one on how to feasibly develop a workflow for our indexing. OHMS, in collaboration with other software, will allow our staff at Go For Broke to tirelessly disseminate the story of these heroic Nisei Veterans to an international audience for decades to come. The fact that OHMS is making that a very real and inevitable possibility is amazing, and I believe that is the highest compliment that I can pay to OHMS. I am excited to continue working with this platform to share the Nisei story. This is my first experience working with the Oral History Metadata Synthesizer and so far I am very impressed with what a great tool it is for both archivists and researchers alike. I studied history in college and have some experience with metadata and archiving programs, but had no experience with OHMS prior to interning at the Go For Broke National Education Center. One of the things I like about the program is how user friendly it is. Using OHMS is not as a daunting as a task as it may seem; tagging the videos and adding keywords to each section is simple and straightforward. From the other perspective, searching for terms in the Google-like search box is an extremely efficient way to find a subject within the video, rather than having to scroll through the video manually. For this reason alone, OHMS can be a great resource for researchers wishing to use information from an oral history interview. OHMS really helps oral histories become a practical resource for researchers and students, bringing about an interactive quality to these videos that did not exist before. All oral histories, but especially those that we work with here at Go For Broke contain valuable insight, discussions, information, and first-hand knowledge on topics that are very important to the history of our country. It is my belief that OHMS will help expose these stories to a wider audience and change the way the public is able to utilize oral histories. As stated before, I am relatively new to using OHMS, but in the few months I have been using it, my experiences with it have been overwhelmingly positive. For someone new using the program, I would offer to approach using OHMS with confidence. The program is not complicated and once you get the hang of using it, the videos come alive that much more. Also, be gratuitous with your keywords and split the videos into cohesive sections. While OHMS is a great tool, it is also up to us to use our own skills to bring out the best of these valuable resources. My experience with the Oral History Metadata Synchronizer, so far, has been a very interesting experience. I come from an English education degree background, so I have never dealt with anything like this before. I have used similar tools and other resources that utilized oral histories and interviews, but I have never worked on this side of the computer screen. I have really enjoyed actually watching the interviews and seeing the facial expressions of each of the Nisei veterans change with the story they are telling. It never ceases to amaze me how vivid and strong these stories are after all of these years. I also really like how user friendly the OHMS system is. After the first interview, I knew exactly where to go when I was looking to update the summary or when I needed to revise an interview video I had already worked on. The layout of the system and the tools available are very intuitive and easy to follow. The only thing I have a complaint about, and it is a small one, would be the separation of the metadata and the actual interview. I understand why it was done, as to make it easier to organize, but having to exit a menu to go to another menu to edit the summary can sometimes be a little bit irritating. What can I say though, I am from a generation that desires instant gratification and streamlined user interfaces. Again, this is a minor, minor, minor inconvenience and I understand why it was put in place. Being new to indexing and using a tool like OHMS, I have learned a great deal. As I have previously stated, I am used to doing research papers that require the use of first hand accounts of information. Besides written memoirs, the next best thing is interview clips or audio clips. I am just fascinated with not only each of the men’s wartime experiences, but their family lives as well. I have learned so much in such a short time, but I would say the biggest thing I have learned is how specific a keyword can be, when compared to segment titles or other information. This concept took a while for me to grasp with a tight grip, and I am still finding myself being too encompassing in certain respects and missing too many details in others. This is an involved process that will take more time than I initially anticipated, but it has been a fun journey so far. I definitely can feel overwhelmed by the impact our work can have on the future generations. The legacies of each of the men who were interviewed will, unfortunately, be forgotten if we do not do a great job of preserving their story. For the families, students, and future generations, the indexing done for these oral history interviews is an amazing resource and project to be a part of. I originally started this internship because I had a personal connection, but I now want to continue this work to help anyone else who is interested in learning about these great men and the sacrifices they endured for our country. Finally, my advice would be just to soak it all in, and take the time to really appreciate the legacy and the history you are watching. It may seem cliched, but once these brave men pass away, their stories would live on only through their families if we did not have this amazing resource. Take full advantage of it and learn from your mistakes. Don’t be petrified to record too much or paralyzed and record too little. The best way to learn is hands on experience and learning from your mistakes. Take that dive off the deep end and then take the time to go over it with someone more experienced to learn how you can improve. I am not an archivist or a collections specialist. But day-in and day-out, I am constantly reminded how much I depend on the work that they do. As a public historian and a content specialist, I could not do my job without the hard work that archivists do daily. They put in long hours, often behind-the-scenes, preserving and cataloging all of the primary documents that we historians rely upon. To put it simply, without archivists, historians could not exist! Imagine my excitement when our resident archivists told me about the new tool that they were pioneering – the Oral History Metadata Synchronizer (OHMS). OHMS, developed at the University of Kentucky, allows historians and the general public to search through oral history interviews online in the most efficient manner yet created. Put simply, finding exactly what you want within hours of oral history interviews is now seconds away. OHMS allows viewers to search lengthy oral history videos by keyword, and then takes you directly to the spot in the video where your keyword is mentioned. It literally cuts research time exponentially! For historians and the general public, the long days of viewing entire oral history interviews for a few small clips relevant to your interest is a thing of the past. Here at Go For Broke National Education Center, our archivists are hard at work every day bringing our approximately 1,200 interviews onto the OHMS system. Once they have finished, I know that myself – and countless other historians and people around the world – will be so thankful for their outstanding efforts preserving this important history. The interviews of the courageous Japanese American veterans of WWII will be more accessible than ever before! What Are You Working On, Summer Espinoza? This past month has been an exciting one for our archives! We’ve brought on three graduate student interns who will be helping us index over 4,200 interview files (representative of our 1,180 oral histories) and Gavin Do, our associate archivist, has joined our growing team. Our project has seen some significant progress as we’ve moved to a new web-publishing platform where we will be able to maximize user accessibility to our intensive indexing and cataloging. Once our project is done, users will be able to apply textual searches to oral histories. Currently, we are testing functionality between the indexing application, the Oral History Metadata Synchronizer and Omeka, our web-publishing platform. Our team also met with scholars, Drs. Kristine Dennehy, Linda Tamura and Thomas Philo, who provided us with fantastic feedback on our subject heading thesaurus. I also had the opportunity to present our project at the first-annual Society of California Archivists Mini-Conference focused on digital initiatives. Although I do not have the opportunity to spend much time with the oral histories, I do have the opportunity to guide our indexers and it has been nothing short of inspiring to see both staff and interns working so diligently to unhide these unique narratives. What Are You Working On, Sean Stanley? I am currently working on an interview with Mr. Roy Matsumoto, who served among the Merrill’s Marauders in Burma and Southeast Asia. Mr. Matsumoto’s story is a fascinating one; Roy was born in Los Angeles, later moving to Japan to attend school, before moving back to Long Beach and finding work as a grocer. Mr. Matsumoto was imprisoned at the outbreak of World War II and classified 4-C, or enemy alien, despite being a citizen of the United States. After spending some time in an internment camp, Mr. Matsumoto was able to utilize his knowledge of the Japanese language and was chosen to undertake a mission with the Merrill’s Marauders in Southeast Asia. Roy became a master sergeant and served on the Intelligence and Reconnaissance Platoon and as an interpreter throughout the Marauders’ campaign in Burma. What struck me throughout Mr. Matsumoto’s reflections was the enduring theme of loyalty to his county, despite the fact that discrimination was at its highest point against Japanese Americans in the States during World War II. Roy was also faced with the difficult task of fighting a war which pitted him against relatives and friends (his cousin and brother both served in the Japanese Army) and put his family in harms way (his extended family just escaped the bombing of Hiroshima). While critical of the treatment of fellow Japanese Americans during the war, Mr. Matsumoto never hesitated to help serve the country that was his home and he loved. It may be hard to imagine having to face these types of situations, but the truth is Roy Matsumoto was not unique. There were thousands of Japanese Americans that experienced similar effects of discrimination and cultural allegiances that made the war era very difficult. In a quote from an earlier interview with Grant Hirabayashi, Japanese Americans, especially soldiers were “happy to be accepted for who they were” while serving in the military, giving them back a sense of pride and belonging through this trying time. 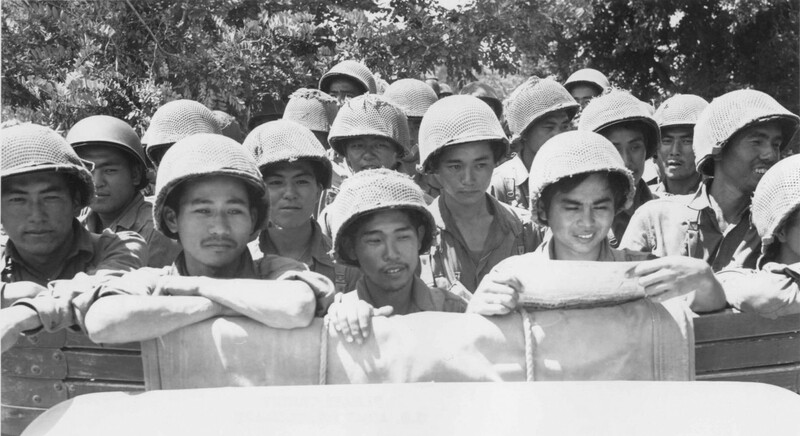 Despite all of this, many Nisei soldiers served their country with the utmost respect and loyalty. When we see and hear discrimination in history, I believe there is always an opportunity to learn and better ourselves as a society and these men’s stories can be used as tools for understanding the importance civil rights in our own modern society. What Are You Working On, Alan Hino? That quote really had an impact on Mr. Nishime, since it had stuck with him after all of these years. The weight and responsibility of that quote must have been humbling to hear as a young man entering combat. The “necessary sacrifice” was such a bold statement, I had to rewind it a few times to fully understand its meaning. For these men, it was not enough to defend our country – their Captain demanded sacrifices so they can all call themselves Americans. This was such an awe-inspiring quote for me. It stuck with me throughout the rest of the day, and I felt a renewed patriotism. This quote tied directly into another quote that Mr. Nishime had discussed. While describing his family history, he mentioned that, although his parents did not offer him this advice before he left, he had heard that many Japanese families telling Nisei soldiers to “not shame the family name.” This quote really showed how important pride, honor, and family were to Japanese American soldiers. Rather than focusing on the individual and the danger the soldier would be facing, the family focused on their name. This reminded me of the old saying that “wounds heal, scars fade, but glory is forever.” Your actions will be forever attached to your name, and your name is something that cannot be so easily forgotten. This quote was something I just quickly glossed over the first time I heard it. But when I took the time to really pay attention, it hit me like a ton of bricks. Although they were never spoken to me explicitly, my family has always preached this sense of pride. This pride comes with being courageous and doing what is right. Like the Captain’s quote, the actions and sacrifices of the soldiers ties into their status as Americans. So, too, does the actions of the soldier tie into the family name.